iPhone lets you run many apps at the same time. View your running apps. 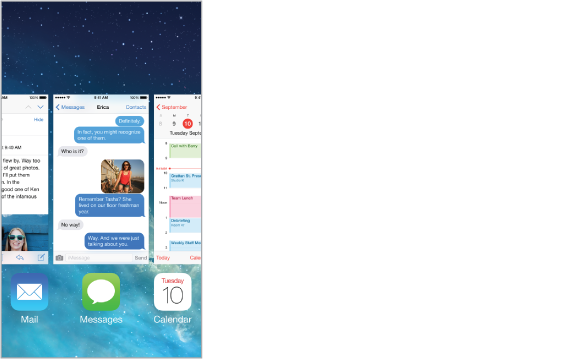 Double-click the Home button to reveal the multitasking display. Swipe left or right to see more. To switch to another app, tap it. Close an app. If an app isn’t working properly, you can force it to quit. Drag the app up from the multitasking display. Then try opening the app again. If you have lots of apps, you can use Spotlight to find and open them. Pull down the center of the Home screen to see the search field. See Search.